Kia ora and welcome to our first kōrero nehe blog post here on he kōrero o te wā – a fortnightly feature where you can learn all about the history of objects and places around the Wellington region. 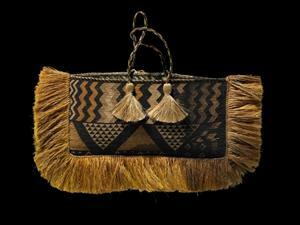 This month our focus is on items which are part of the Taonga Māori collection at Te Papa. I would like to introduce you to an item which is attributed to my own iwi, Ngati Porou. The item below is known as a kete taniko (a bag with fine embroidery or weaving in a geometric pattern). It is a rare example as it has a variety of geometric designs. It is made of dyed muka (flax fibre) and is dated at 1800–1900. The weaver is unknown. This kete taniko was acquired in 1907 from the high-ranking East Cape chief Matutaera (Tuta) Nihoniho (Ngäti Porou), along with a collection of other Māori taonga.